Cleaning My AirDucts... Is It Really Important? During normal operation, dust particles possibily containing pollen, mold, mildew, bacteria, and dustmites will start to build up in every crack and crevace, eventually building up on the flat surfaces. This build up overtime will cause your HVAC system to preform inefficently. After our cleaning services, you HVAC system will not only preform efficently, but your air quailty will be increased! 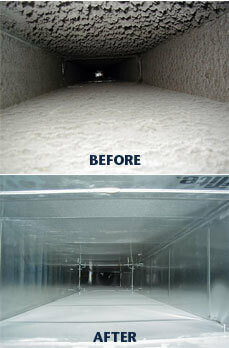 For saftey reasons, AirDuct cleaning is preformed while your home is unoccipuied. Special equiptment is used to insure all build up is removed completly, along with the proper filtration system and containment barriers.